Free Comic Book Day! And the After Party I’m helping to host! Back in November of 2014, I was properly introduced to the irreverent fun of The Deadites live. [You can read about my experience buy clicking HERE] I was not prepared for the experience I had, but I had a blast. And since then, through the Trick or Treat Radio Podcast, I’ve become really good friends with these guys. I was even invited to the birthday party of one of the hosts party this past weekend! (That was Dynamo’s BTW). I made a pretty baller poster for his birthday present too – which I’ll past at the end of this. So, if you happen to be anywhere near Worcester Massachusetts on May 2nd you should come nerd out with me and the rest of these awesome folks. Music, beverages, comicbooks, and costume contests. I’ll be coming in my American McGee’s Alice costume 😉 Details to which I will be posting as I finish putting together the outfit. And yes, I realize the judge doesn’t need to come in costume, but how can I possibly go to a cosplay themed event and not got all out? That would be a sad sad day in Jeanette-land. DynoMyra, Trick or Treat Radio and Haunting TV present the Free Comic Book Day After Party you’ve been waiting for! There will be comics, costumes and candy! Do not miss the spring nightmare party of the year! 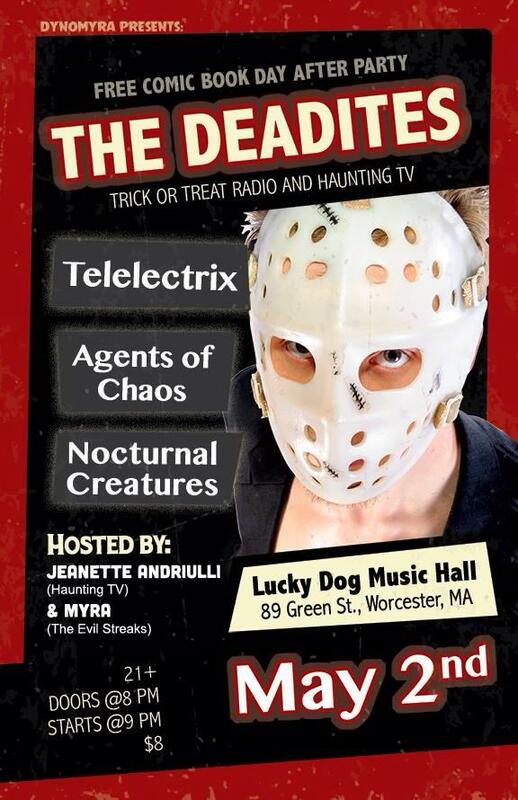 Headlining the event is your favorite candy eating, monster hunting, keyboard slinging freaks, The Deadites! The event will be hosted by Myra of The Evil Streaks and Jeanette of Haunting TV! Comic book Character Costume contest!!! Haunting TV will be filming A Deadites video!!!!!! I’m so freakin’ excited about this!! Not just because of the cosplaying, seeing my podcasting buddies, or even seeing these awesome bands in concert, but also because that’s the day Haunting TV starts filming the music video for The Deadites!! It’s going to be a crazy day and I can’t wait! Also here’s that fan-art poster I made for Dynamo. ^.^ I based it off of poster art for one of his favorite movies “Running Man”. Then I drew him into the costume of the villian, “Dynamo” with his band mate Tiny Wight in the running-man track suit. It was so much fun to draw. And it turns out that Dynamo really loved it. Yep, Dynamo really liked his present.